This past month I attended Master’s Conference and met with the Northeast Masters. We are always talking about how to get new members in the Grange. We all have seen a large decline in members in our State Granges, and constantly ask how to get new members. I have talked with the State FFA officers at Ag Day as to why we can’t attract FFA members to join the Grange. They seem to answer that FFA members are so busy with school, projects, work, getting ready for college that they don’t have the time to do anything else. They suggested we approach 4Hers as potential members and may get parents to join in as a family activity. They also suggested that we advertise at local fairs to get the Grange out in the public. I have also been asked what I am doing to get new members to join. I can’t get you new members in your community, these are your people, neighbors, friends, family. Only you on the local level can get new members for your Grange. 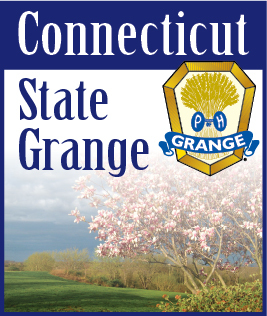 The State Grange Membership Committee can get you supplies and membership packages for your Grange but you have to ask for them. We have lost a lot of members, many by death. We have lost the youth and young adults as new members. We have to look outside our normal operations of the Grange. Technology is the new norm for the youth, we must adapt for them to interact with us. The Grange story has survived 150 years, did our founding fathers think the Grange that they developed would still be here today with the same format they designed? Our value is honesty, charity, fellowship, ethical, faithful. We hold these values close and this does make us different from other organizations. We are family, whether we like it or not. Let us all work together to get new members. The National Grange Convention will be in Stowe, Vermont this November. We had a walkthrough of the Stoweflake Resort to see the layout of the Convention. The resort is charming, but tight, food will be great but rooms are limited. The Night of Excellence and Seventh Degree is off-site. The good thing is plenty of local restaurants around. Ben & Jerry’s is just down the road. Bad news is it is six hours from home, main road is under construction, and weather is unknown (snow). The convention committee has been praying for great weather, even the locals have said the weather was great last November, fingers crossed. Connecticut will host the hospitality room on Saturday, the last day of the Convention. So we will be looking for volunteers to help man the hospitality room. Chairpersons for Connecticut’s hosting of the Hospitality Room are Todd Gelineau and Faith Maus. Please contact them if you would like to volunteer. The Big E has again changed the process for handing out tickets and parking passes to vendors. We will have application forms for those who wish to work and the New England Grange Building and for marching in the parade on Grange Day. The bridge outside Gate One is supposed to be under construction during the fair so traffic will be rerouted around this so it may impact shuttle parking. We will see at the May meeting. If you wish to work in the Sales Room in the Grange Building, or be in the parade, please let me know. We have sold Litchfield and Echo Grange Halls so there is some furniture and regalia available at the Central office. We would rather let a Community Grange use these items than store them here. Agriculture is going through trying times, with trade tariffs, low farm prices, pressure from outside vendors, we must support our farmers. In New England, our dairy farmers are struggling to stay in business, even with the Boston and New York fluid milk markets our farmers are being squeezed by outside markets and a flood of surplus milk. Over the years we have lost many local processors, Sealtest, Mosiers, Dairy Mart, Lincoln, Yankee Milk (powdered milk) so a lot of milk is brought in from other states. Organic milk from California, a2 milk from Australia is now being advertised. They are all battling against our local dairy farmers. Something has to be done to protect local farms. Drink more milk!